1914, Serbien muß sterbien, The Initial Campaigns on the Balkan Front in WWI realistically covers the battles fought in and around Serbia during the first year of World War One. 1914, Serbien muß sterbien (an Austro-Hungarian jingle that translates to “Serbia must die”) is a comprehensively researched model that explores the intriguing set of campaigns fought in Serbia in 1914. The game includes an accurate order of battle and detailed game map. The map encompasses the primary theater of war from Peterwardein in the north, Sarajevo in the west, to Niš in the south-east. The game system used is the same as found in 1914: Offensive à outrance (GMT). The game has a playtested, concise, well written and organized 24-page rules booklet. 1914, Serbien muß sterbien includes three sceanrios. Two short scenarios and a Grand Campaign scenario that covers the period from the initial Austro-Hungarian invasion in August to exhaustion a stalemate in December. 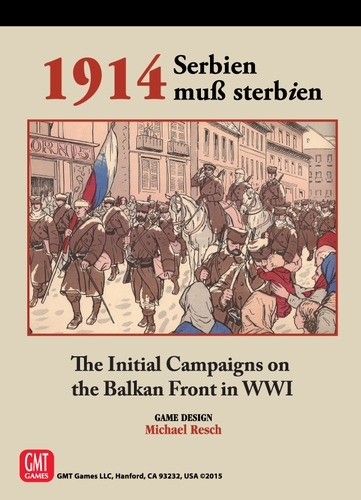 The game-design goal for 1914, Serbien muß sterbien is to produce an enjoyable game from which players can learn a great deal about the campaign and the geography of the theater of war. The result is a game that the "WW1 enthusiast" must have and that a gaming connoisseur will enjoy. The combat units are primarily Divisions and Brigades. The map’s scale is 1:500,000. Each hex is approximately 8 kilometers across, with the corresponding area being roughly 6475 hectares (or 16000 acres). Each game turn represents from two to four days of time depending on the season.